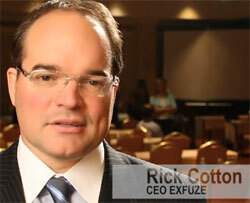 eXfuze launched in early 2008 and are based out of Florida in the US. The company is headed up by Co-founder and Chairman, Rick Cotton. involvement of nearly 10 years abroad with a non-profit ministry developing businesses and programs to benefit the mission, and overseeing all Latin American operations. Rick Cotton has served in more than 10 countries and has a strong command of culture, language and international business. On the MLM side of things, I’m not sure if it’s the same guy but a Rick Cotton was President of something called “Viva Toxic Free”. I wasn’t really able to find out much on that opportunity, other than it seems to have been active between 2007 and 2011. Like eXfuze, Viva Toxic Free was also based out of Florida however there’s not a whole lot of information out there on it. Possibly just a co-incidence, a charity division of eXfuze appears on the company website by the name of VivaKids. Rick Cotton is credited on the page as being the co-founder of VivaKids. I wasn’t able to get any further information on the VivaKids Foundation as the website was not responsive at the of publication. In any case, other than possibly being involved in Viva Toxic Free, Rick Cotton doesn’t appear to have any other history within the MLM industry. Read on for a full review of the eXfuze MLM business opportunity. eXfuze operate in the energy and nutrition MLM niche, marketing a range of what they refer to as “multi-botanical” beverages. a proprietary blend of seven of the world’s most legendary, nutrient-rich botanical extracts, enhanced with the Chaperone Molecule, which is capable of carrying a higher percentage of vital nutrients to the desired locations in the body. eXfuze has combined the powerful nutrition of these seven superfoods (also known as functional foods) with four other potent ingredients known as the PLUS factor of Seven+. These four ingredients (pomegranate, wild blueberries, Aloe Vera and Concord grapes) are renowned for their antioxidant properties. The eXfuze compensation plan provides affiliates with retail (preferred customer) commissions, a Fast Start Bonus, residual commissions via a binary compensation several other incentives and bonuses. eXFuze offer retail commissions on all their products when affiliates sell them preferred customers. A preferred customer is a retail customer (non-affiliate) who agrees to sign up for a monthly autoship order. 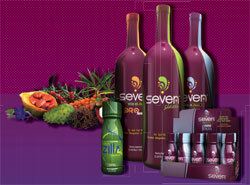 For every bottle of Seven+ Classic and Seven+ PROformance sold to preferred customers, the affiliate who introduced them to the product receives a $10 commission. 12.5 points of Product Volume (PV) and Business Volume (BV) is also credited to the affiliate, with the BV going towards the affiliate’s lesser binary leg (see “binary commissions” section of this review below). In order to qualify for commissions other than those earned on preferred customer order, an eXfuze affiliate must maintain a minimum monthly autoship order of 100 PV. This PV can be generated via sales of eXfuze products to customers, or via an affiliate’s own purchase of 100 PV or more of product. Note that a Pro 300 and Pro 700 qualified unilevel leg is a leg in an affiliate’s unilevel team that has a commission qualified Pro 300 or Pro 700 affiliate in it respectively. When an affiliate recruits a new affiliate who signs up with an Upgrade Pak, they earn a Fast Start Bonus. As eXfuze do not provide the cost of these Upgrade Paks on their website, I’m unable to provide any further information on the Fast Start Bonus. If an affiliate is generating at least 200 PV a month, they qualify for a Fast Start Match. The Fast Start Match is a matching bonus paid out on the Fast Start Bonus commissions earnt by any affiliate they’ve personally recruited. How much of a percentage of the Fast Start Bonus is paid out as a matching bonus can vary, as it is ‘determined by eXfuze and may be subject to change‘. Residual monthly commissions are paid out in eXfuze using a binary compensation structure. These two positions form the start of two legs, with the volume generated by the lesser leg being used to calculate an affiliate’s residual commission each month. Commissions are paid out at a rate of $30 per every 300 BV generated by an affiliate’s weaker leg. Volume is matched against the stronger leg with any leftover volume carrying over to the following month. Note that in order to qualify for binary commissions, an affiliate must have personally recruited at least one commissions qualified (100 PV a month) eXfuze affiliate in both their left and right binary legs. The structure of this bonus is to promote optimum balance in the compensation plan. For details on the current Chairman’s Pro Bonus, visit the eXfuze.com Opportunity section. However no such section exists on the eXfuze website (at least not publicly). The Director Check Match Pool offers affiliates a check match on the binary commissions earnt by those they’ve personally recruited (their direct downline). The Director Check Match Pool is paid out using a unilevel compensation structure, with affiliates able to earn commissions down seven generations deep. 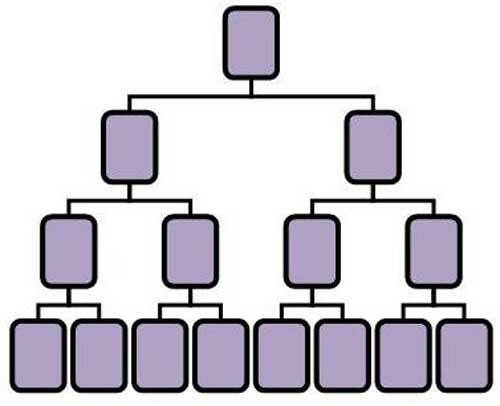 A unilevel compensation structure places an affiliate at the top of the structure, with every personally recruited affiliate placed directly under them (level 1). If any level 1 affiliates recruit new affiliates of their own, they are placed on level 2 of the original affiliates, structure. If any level 2 affiliates recruit new affiliates they are placed on level 3 and so on and so forth. The Director Check Match Pool is paid out according to generations, with each unilevel leg being qualified individually when one “Director” ranked affiliate exists within it. A generation is defined as all affiliates between the Director ranked affiliate and the affiliate whose downline it is. Eg. if the Director ranked affiliate falls on level 3, all affiliates in that particular leg on levels 2 and 1 will count as a generation and pay out a Director Check Match. In this manner an affiliate can qualify on up to seven generations in any one unilevel leg. How much of a percentage the Director Check Match pays out is a “floating percentage”, using any BV not paid out elsewhere in the compensation plan (up to 55% of the monthly global BV generated by affiliates). eXfuze reward their “Elite Director” ranked affiliates (Ruby or above) with a series of VIP getaways, ranging from a holiday in Florida with eXfuze’s executive staff to “monumental adventures” in “some of the world’s most luxurious destinations”. Standard affiliate membership to eXfuze is $40, with an optional purchase of an “Upgrade Pak”. eXfuze do not disclose the cost of these Upgrade Paks in their compensation plan or anywhere that is publicly accessible on their company website. eXfuze have an easily retailable product line however retail commissions (outside of preferred customer orders) aren’t mentioned anywhere in the eXfuze compensation plan material. This is concerning because each affiliate is given a replicated eXfuze storefront so quite obviously retail commissions exist, yet there doesn’t seem to be much emphasis placed on them. Another red flag is the lack of public disclosure on what the Upgrade Paks cost for newly recruited affiliates. This wouldn’t be an issue however with the Fast Start Bonus paying out a direct commission on the purchase of an Upgrade Pak by a newly recruited affiliate, the information is crucial to prospective affiliates. On the topic of the Fast Start Bonus, given it’s tied into the purchase of an Upgrade Pak which is only purchaseable once by newly recruited affiliates, it brings eXfuze into a bit of a grey area. On one hand the Upgrade Paks are product sales, yet they are only available to newly recruited affiliates. When combined with a monthly autoship, the possibility is there to just focus on recruiting new affiliates, getting them to purchase an Upgrade Pak and then whack them on monthly autoship. When you consider restrictions on residual binary earnings to Bronze ranked affiliates or higher, the lack of focus and clarification on retail customer sales does lead itself to a focus on affiliates and monthly autoship orders. The preferred customer commissions are a step in the right direction but at least some mention of retail commissions needs to be made in the eXfuze compensation plan material. As it stands now there’s far too much focus on affiliate orders and autoship. Disclosing the cost of eXfuze products on the website to the general public woudn’t hurt either, as prospective retail customers can’t even access the store and prices without an affiliate’s referral code. One neat thing I liked in the eXfuze compensation plan was the creation of an “affiliate” class. I don’t think it costs anything to become an affiliate, however they still earn “up to 25%” on the product orders of other affiliates they recruit, as well as earning a Fast Start Bonus on any distributors they recruit too. I thought this was a nice touch to get a feel for the business and how the products fare within the marketplace. I’d definitely recommend trying eXfuze’s products first before jumping in as a distributor, as, even though the cost isn’t disclosed on the website I’m tipping it’s on the expensive’ish side of things with eXfuze paying a $10 + binary volume commission per bottle sold to preferred customers. Also it’s probably worth checking out how many affiliates on autoship your potential upline has versus retail/preferred customer volume each month. A majority of affiliate autoship revenue might be problematic in that it reveals a lack of retail activity within the company, and pretty much guarantees that you’ll have to focus on recruiting new affiliates if you want to generate any substantial income as an eXfuze affiliate. On the other hand if retail and preferred customer volume is dominant (which it should at the upper levels of the affiliate ranks), and after testing them you think you’ve got a shot at marketing the eXfuze product line – you might have just found your new MLM home. i read the information that you have about exfuze opportunity that information it’s close but not up to date. if you want i will provide you whit the complete Comp plan and will introduce you whit a corroborative personal that will answer any question. And i will like to NOTE: you Don’t need to be a Bronce Director to get paid Residual you start collect a 10% residual at the position of Pro300. Comp plan is available on the eXfuze website. Care to point out what’s changed? If it’s significant I’ll consider a new comp plan writeup. you Don’t need to be a Bronce Director to get paid Residual you start collect a 10% residual at the position of Pro300. The eXfuze comp plan “CODE PAY CHART” shows Bronze at the lowest percentage of 5%. Pro300 is not mentioned. The 0-49 PV Pacesetter Bonus of 15% wasn’t there before, but is tied to single-level commissions only. The MLM still requires 50PV, and given this is the autoship amount, is likely to just be met by an affiliate’s autoship order. Distributors may qualify for Pacesetter 2-4 by achieving 50PV by business close day each week, to potentially earn on every personally introduced Distributor’s first order within your Personal Marketing Organization of an optional Challenge Pak. It’s not really optional if a Pak purchase is how everyone is qualifying and getting paid at the same time. Pseudo-compliance isn’t actual compliance. The heart of the eXfuze compensation plan is the Team Commission or Binary Structure. This means that your eXfuze organization has two “legs”or sides. When you enroll a new promoter, you have the option to place them in your organization on either your right or your left leg. When you become Team Commission qualied, you can earn longer term commissions on the eorts of your “Binary Team”, which consists of all promoters who are enrolled below you, whether you enroll them directly or not. 1. Your Personal Volume(PV) is 100 in the past 30 days. 2. One of your directly enrolled Promoters on both your right and left legs each have 100PV as well. As your Binary Team grows, and as Challenge Customers or Promoters in your organization purchase products, the PV that each of them generates translates to Business Volume (BV) for you. Team Commissions are triggered when you achieve 300BV or more on both of your Binary legs. You are then paid 10% of your weaker leg the following week. For example, if one of your legs has 300BV and the other 500BV, you are paid on a commission of 10% ($30) on the weaker 300BV leg. Thanks for that. They do seem to have updated the binary rank requirements. When I wrote the review anything below Bronze didn’t qualify for binary commissions. The unilevel is still locked out, but at least the binary is something. I noticed they also added retail commissions to the plan, so perhaps someone from the company stumbled across this review. The 100 PV a month (or getting your recruited affiliates on 100PV a month autoship) is still indicative of an autoship focused opportunity though. You yourself, do you meet the monthly volume requirements with retail or autoship? we have a challenge 4 and Pay No More Program, the true is that i never pay for my monthly volume requirements, i get $400 of free product that qualify me. I always read yours post, i know you always bring the most accurate information. That why a like to ask you to review all new aspect of the Exfuze compensation Plan, especially after the 20th of September. i will like to read your analysis of the Whole Plan. So the four people making up your volume quota, affiliates or retail customers? That why a like to ask you to review all new aspect of the Exfuze compensation Plan, especially after the 20th of September. What’s happening on the 20th? No need to thank, it’s a fair enough call to point out compensation plan changes. If the changes are significant enough I pen an update. That companies change their plans (hopefully for the better) is a sign that at least they’re attempting to address and grey and/or problematic areas that might have been detected. I myself can’t keep forensic track of the hundreds of companies I’ve reviewed, so I appreciate affiliates letting me know when significant changes have taken place. Guess what: that’s referral selling, and that’s probably illegal. A “referral sale” is typically defined as the provision or offer to provide a customer a prize, discount, rebate, or other compensation as an inducement for a sale that requires the prospective customer to give names of other prospective customers to the seller, if earning the prize, discount, rebate, or other compensation is contingent upon a sale to one of the “referred” customers. To the surprise of most people, particularly sales persons, referral sales are illegal throughout the United States. I have been with eXfuze since early 2009, and have been a Pro 300, the first step in the rank structure after affiliate, most of that time. Whenever my weekly volume exceeds $300 per week I make a commission. You are correct in that the check match does not start until you reach Bronze, but the binary commission payments start as soon as you reach 300 BV on each leg (you become commission qualified by having two distributors who each purchase 100 points of product (as little as $110.00)). The “4 and Pay No More” program has been very beneficial to us; we have only had to pay for our monthly auto-ship once in the past year. We now receive about $400 dollars in product free every month, we only pay about $25 in shipping. This is not based on “referral sales” but on new customers or distributors” which we enroll after the start of the program (Sept 04 2013). eXfuze has always had a decent customer program but it is now much much more financially interesting. This is not based on “referral sales” but on new customers or distributors” which we enroll after the start of the program (Sept 04 2013). So John, how much of your commissionable volume each month is derived from retail sales and how much of it is from recruited affiliates? 1) To qualify you need a total of 4 customers or distributors with a total volume of 4 times your free product. In our case, all our qualifiers are customers. In active distributors tend to stay on our products because our products work and they are not expensive: eXfuze Classic is $32.97 for a one month supply. So your retail ratio was 14.3%. Point for being honest but that’s pretty low. If that’s reflective of retail activity company wide then retail revenue is bordering on insignificant. Ps. “Customers” isn’t an important metric, it’s retail (non-affiliate (inactive doesn’t count) sales) that matters. I feel like we are having a major miscommunication here, I must not understand what you mean by “retail sales”. To me a retail sale is a sale to a person who does not intend to do the business but just wants to benefit from the product. With that definition numbers 1 and 2 above are total retail sales, a total of 477.00 out of $537.00 in total payment. This is 88.8% Retail Sales. None of the $477 was from recruitment, other than “recruiting” new customers. And a part of the other $60 in commission was from retail sales, but I have no way of knowing how much. What they intend or don’t intend to do is irrelevant. If they signed an affiliate agreement they are affiliates. Inactive affiliates are still affiliates, they just don’t qualify for commissions. Retail customers are customers who are solely customers, they never signed an affiliate agreement. affiliates. Again, the blanket label of customers is irrelevant. The reason for that is because a product-based pyramid has no retail. Yet they’ll swear black and blue it isn’t a scam because they have “customers”. And a part of the other $60 in commission was from retail sales, but I have no way of knowing how much. So in reality it could even be less than $60 (or non-existent at all). 1) One of the first people we recruited was my wife’s parents, 84 years old, at the time. We signed them up as distributors so they could get the lowest product price. Since eXfuze changed the pricing structure (09/14) to make auto ship customers and distributor pricing the same, we would now have signed them up as customers. Legally they may be distributors (affiliates) but they know, and we know, that they are now, and always have been, customers. You said, “None of the $477 was from recruitment, other than “recruiting” new” affiliates” (a direct quote from me, but you left off the word “customers”, and added “affiliates”, instead). These customers are not distributors (affiliates), but repeat auto ship customers. They did not sign an “affiliate” agreement. 3) The $60 is binary commission. 50%, or $30 came from my strong leg. Lets call that all distributor volume (although we both know that there will be a retail component in that figure). The other $30 came from people we recruited as customers, and signed up as customers (approximately 85% is customer volume). We signed them up as distributors so they could get the lowest product price. The wholesale customer class exists for this exact purpose. That’s all very well, but is a hypothetical against the reality of what happened. Agreed. Which is a problem because their orders generate affiliate revenue and aren’t retail sales. So they’re wholesale retail customers? If so then good job!